Zellige, zillij or zellij is an enamelled terra cotta tile, which you will find allover Morocco. Those tiles have a typical sparkle and shine that comes from all their flaws and the wildly irregular shade variations of the translucent glazes. The art of zellige exist since the 10 century, probably inspired by the Roman and Byzantine mosaics. The colour palette was limited to white and shades of brown. It remained very limited untill the 14th century when they introduced blue, green, and yellow colours. Red was added in the 17th century. In the 20th century new colours were introduced as glazes were imported and added to the traditional colours. The cities of Fes and Meknes remain the center of this art. 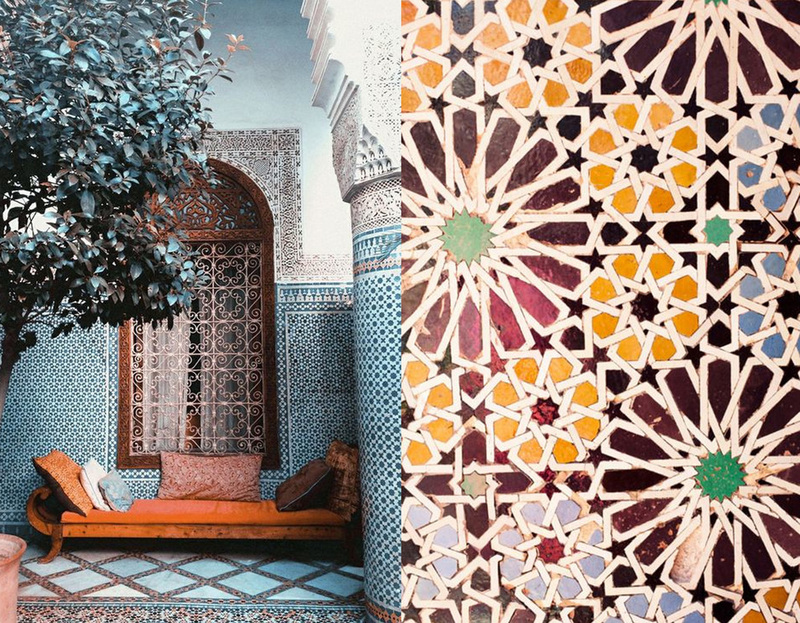 This form of Islamic art is one of the main characteristics of Moroccan architecture. Zellige is used to decorate mosques, public buildings, and wealthy private houses. A statement of luxury and sophistication. It is used to protect the wall to man's height. Geometrically patterned mosaics are used to ornament walls, ceilings, fountains, floors, pools and tables. Zellige making is considered an art in itself, transmitted from generation to generation by maalems (master craftsmen). Training starts at childhood. Lot of attention is needed when creating zellige. 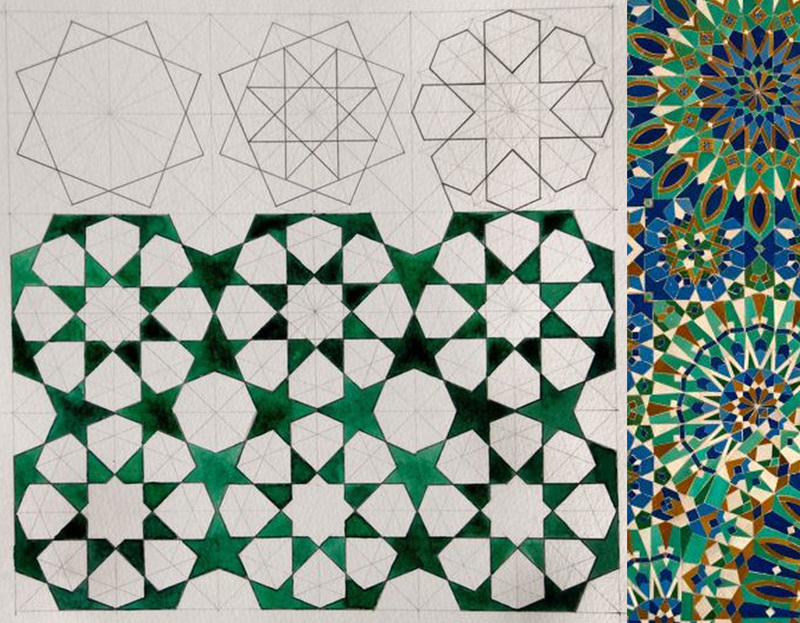 The small pieces are hand-cut, then assembled in a geometrical pattern to form a complete mosaic. The process has not changed since centuries. From Clay to Mosaics: Take a look on the video to see how work intensive it is to create those amazing tiles. The colour palette of the zellige increased, making it possible to multiply the compositions. The most current form of zellige is a square. Other geometrical shapes: octagon, star, cabuchon, cross. etc. make it possible to create very graphical patterns. A limited number of shapes to create geometrical designs in many different ways. 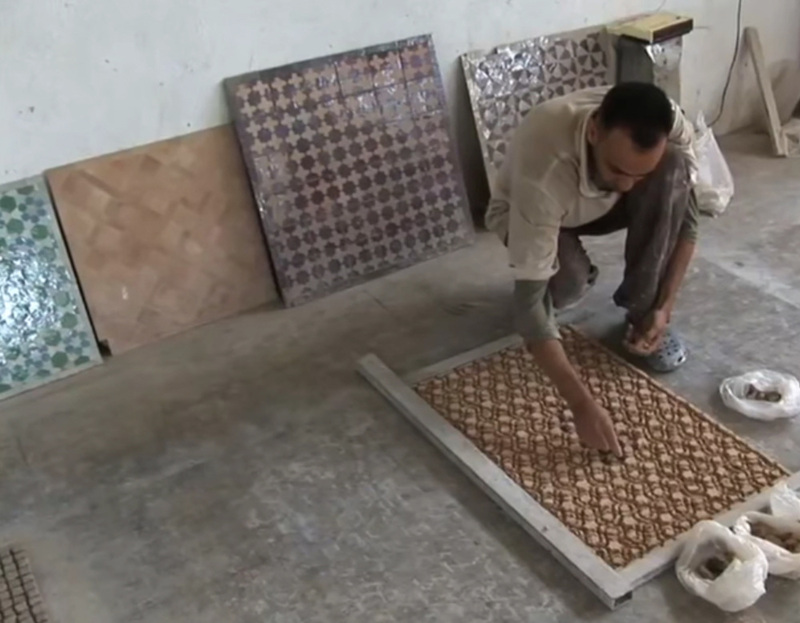 Zellige tiles are entirely handmade and sun dried. Therefor a certain range is to be expected within each colour. They have a lovely gloss surface that will have pits and flaws undulations of surface. You can use zellige without problems in bathroom and kitchen. They have a long history of being used in all types of water features. Zellige can be used in many ways: from traditional, decorative to contempory. Combining different graphical patterns or just plain tiles, it will always be amazing. Islamic decoration avoids to use figurative images. The geometric patterns have developed over the centuries, often build on combinations of repeated squares and circles, which may be overlapped and interlaced. These days we see so many industrial tiles which have achieved perfection, while the zellige have all those imperfections. But it are exactly those imperfections which appeal to me, Their beauty is exactly in their imperfection: the different colour shades, hand-cut tiles filled with history. Imagine those tiles are not made by machines, each piece is handmade, hand-painted. Made by men form mixing the clay till finishing with the glaze. Zellige, with a history going back till the 10th century, will be the perfect tile for you if you are looking for something more magical to put in your bathroom or kitchen. So if you are looking for something more magical to put in your bathroom or kitchen than those tiles form a 10th century tile-making craft are something for you.